Horticulture in Odisha is primarily dominated by plantation crops, vegetables and fruits. Among fruits, mango and banana are major components, whereas citrus mainly lime and mandarin is cultivated in Deogarh, Ganjam and Mayurbhanj districts. The hills of Rayagada district have great potential for fruit crops but the area is characterized by mango cultivation. It has been observed that during the harvesting season of mango, farmers are forced to sale at very low price which acts as an important limiting factor for cultivation of fruit crop. 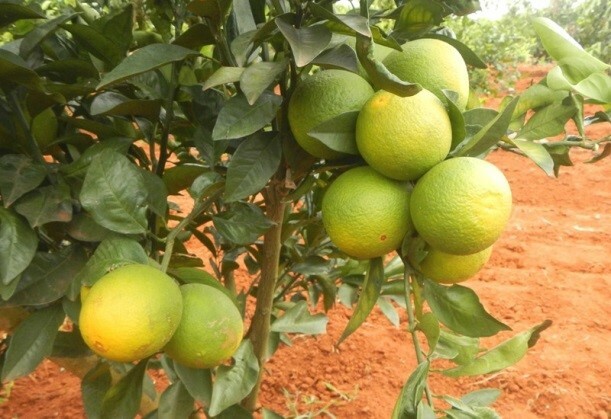 Considering the importance of crop diversification in maximizing economic benefit, CHES, Bhubaneswar took the initiative to evaluate citrus fruits like sweet orange (Citrus sinensis) var. Mosambi and Sathgudi and mandarin (Citrus reticulata) var. Nagpur and Kinnow in eastern hill region of Rayagada. Mosambi and Nagpur mandarin were procured from NRC for Citrus, Nagpur, whereas Kinnow and sathgudi were brought from Ganganagar and Tirupati, respectively and planted at the farm of Sh. K C Mahapatra, a progressive farmer of Kashipur during 2013 at the distance of 5 x 5 m. Standard cultivation practices for water management (drip system) nutrient, pest and disease management were followed. Among different varieties, Mosambi budded on Rangpur lime (Citrus limonia) started bearing fruits after two years of planting. Flowering occurred in March and fruits were harvested in November. Sh. 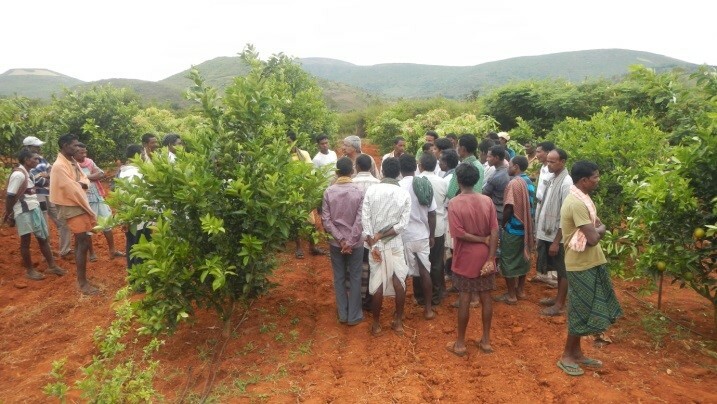 Mahapatra was satisfied with the performance of sweet orange in the region and expressed his keenness to extend this technology among the tribal farming communities. He told that in young plants 8-10 kg fruit/plant can be obtained which may be considered as a good harvest. He sought the help of CHES, Bhubaneswar in the promotion of Mosambi cultivation in the region. Dr. H. S. Singh, Head, realized the potential of Mosambi in enhancing income of tribal farmers and in promoting crop diversification in undulated hilly terrains of Odisha. Dr. Kundan Kishore told that the quality of Mosambi was excellent in terms of juice content (38%), seed (8.5), TSS (10.6 °Brix), acidity (0.48%), TSS/acid ratio (22.0) and vitamin C content (62 mg/100g). Dr. Singh, emphasized the need of technical know-how to ensure quality yield and better market value of citrus and pomegranate. He told that Mosambi can be a viable fruit crops for crop diversification in tribal hill regions of Odisha.